Day 5 started off with Dave realizing he was too sick to join Nathan and I at the Magic Kingdom. So he spent the day at the hotel while we headed off for the classic Disney experience. Nathan was reluctant to go. He's very attuned to what Daddy wants and is doing and generally wants to be just like him. So if Daddy was staying back at the hotel, Nathan wanted to stay at the hotel. It took a lot of coaxing, but I got him out. I decided to wear my Wolverine hat, which ended up getting a lot of attention and compliments (and made me very easy to identify if Nathan and I were separated). The first thing we did was ride the steam train which circles Disney. I'd tried this with Alex and he ended up preferring the monorail. Nathan liked the rattling steam train though and asked to ride it several more times throughout the day. At one point, he insisted on walking back to the train to circle around to Tomorrowland, even though we were only a five minute walk away. But that's okay because this was his magical experience. He and I rode Big Thunder Mountain and he had a great time, shouting and clutching his glasses. Then we went on the Speedway, where he got to drive us around the track, bumping frequently into the rails guiding the cars. The big challenge came in the lead up to lunch. We had reservations with Winnie the Pooh and friends at the Crystal Palace, but almost an hour to wait. I guessed we were about a ten minute walk away, so I thought that left us plenty of time to wait for a ride. Nearby was Buzz Lightyear's Star Command, which had a 30 minute wait. As we arrived, it looked longer, so I warned Nathan we might have to leave but if we did, we would come back. I sat him down and explained that I didn't want a tantrum and he agreed. That would be the last time I trusted his evaluation of his own temperament on this trip. After 40 minutes, I decided we needed to leave (I'd been giving Nathan warnings to try and get a smooth transition). Nathan began to kick and scream and flail and I had to physically carry him out. At which point he bit me to make me let him go. I was shocked. He was never a biter, even as a toddler. 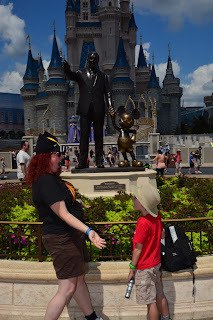 He started throwing things away (his hat, his special 1st visit button, his glasses, his magic band), I shoved it all in the bag. Normally for a tantrum like this, I would find a quiet place and let him work his way through but that usually takes a half hour and we would lose our reservation. I decided to carry him to the restaurant and let him finish the tantrum there. At least they would know we were there and would be unlikely to charge us for the missed reservation if Nathan couldn't pull it together. The staff gave us a quiet and isolated room for Nathan to settle down. I explained he was upset at missing the ride and they gave us a special pass which would let us go back and get on immediately, something Nathan appreciated once he settled down enough to be told. I also asked him if any of his tantrums had worked to get him what he wanted and he had to say no. I asked him to please try and remember that next time. That he could do better if he asked than if he screamed. He recovered enough to take his picture with Winnie the Pooh before we left. We went on to ride the Buzz Lightyear ride, see the comedy show at Monster's Inc Laugh In and rode the Peoplemover at Tomorrowland. We had passes to Space Mountain, but it was shut down for the day. We rode the Mad Hatter Tea Cups and the central carousel instead. I decided not to push it further although I knew he'd wanted to ride Space Mountain. I stopped on the way out at Guest Services and asked if we could switch one of our FastPasses for our last day to Space Mountain. I didn't want to cancel them all since we had passes to the Electric Parade. The girl we spoke to ended up adding an extra pass to our final day so that Nathan would get to ride the Mountain. On the way home, I asked Nathan if he'd had fun, which he agreed he had. I then pointed out that if we'd left when he had a tantrum, we wouldn't have had that fun. I also told him that we would not be visiting the arcade due to the biting and kicking. (Maybe not the most consistent message for stranger danger, but I did not want a repeat.) We did go swimming though, so I think he still ended up having a good day.